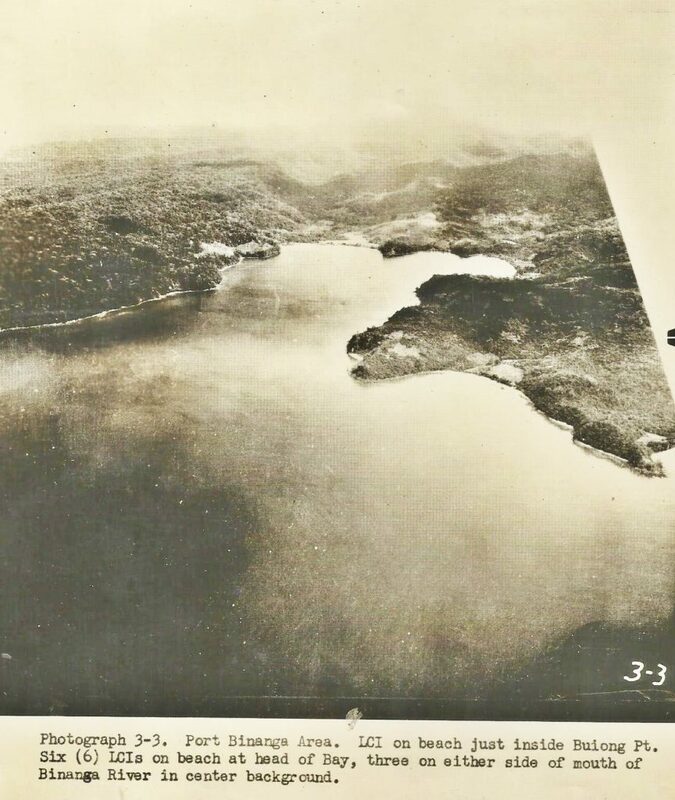 The Mothball Fleet (thru a storm, I’m sure) got scattered, beached, grounded and sunk all over Subic Bay and Port (Bay) Binanga in June 1951 or sometime before that. LT Bruce B. McCloskey, area Salvage Officer, got the task of surveying the situation. In his report (don’t have a copy) he also submitted pictures. A shipmate from the Subic Bay Diving Locker, Rodney Rice, saved about 30 images and gave them to me. I did not know that the Navy kept a small Mothball Fleet here in Subic. Judging from the report, there were a number of ships mothballed in Subic Bay and the Port on Binanga. I don’t know where the ships were anchored. It must have been a cheaper proposition to keep the ships here then sail/steam them back to the USA. 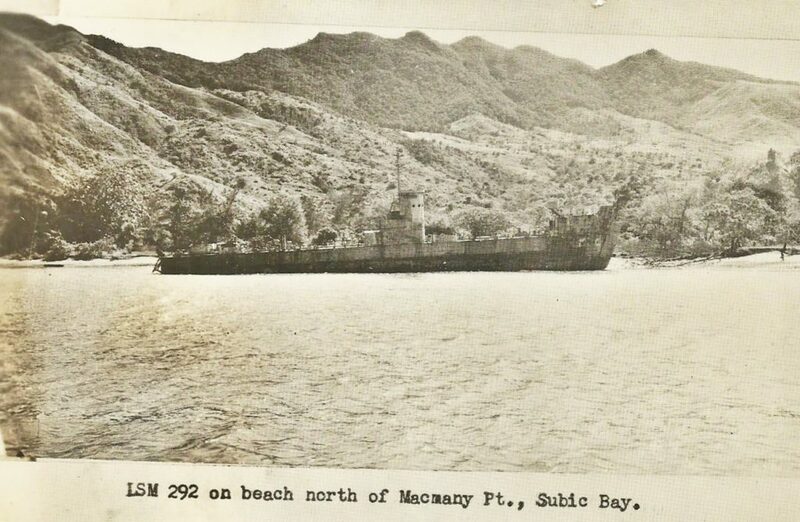 By the time I visited Subic Bay for the first time in 1962, all the ships may have been gone, I don’t remember seeing any. Zc854. 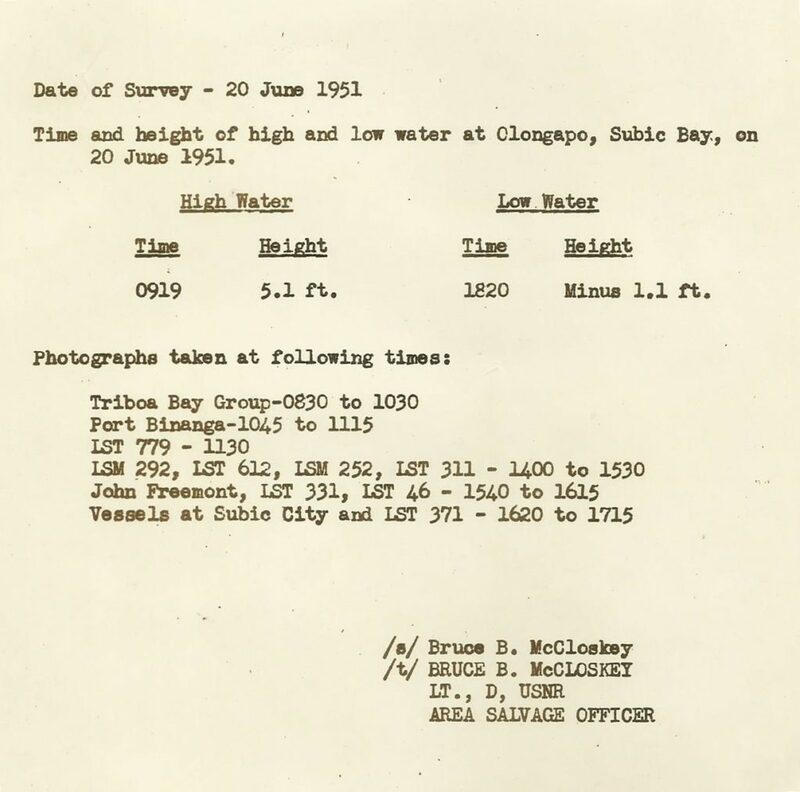 03 1951-06-20 Subic Salvage Survey 02, an old USCGS Subic Bay chart, it was included in the report. With this URL you can download a higher resolution copy, click here! Zc855. 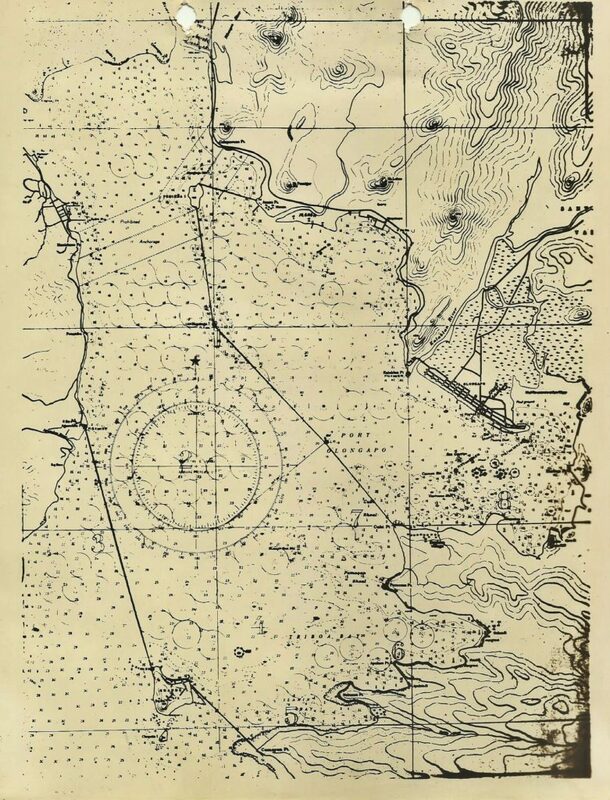 04 1951-06-20 Subic Salvage Survey 03, an 1902 USCGS Subic Bay chart. With this URL you can download a higher resolution copy, click here: On this chart and the previous one you can identify all the landmarks mentioned. Zc856. 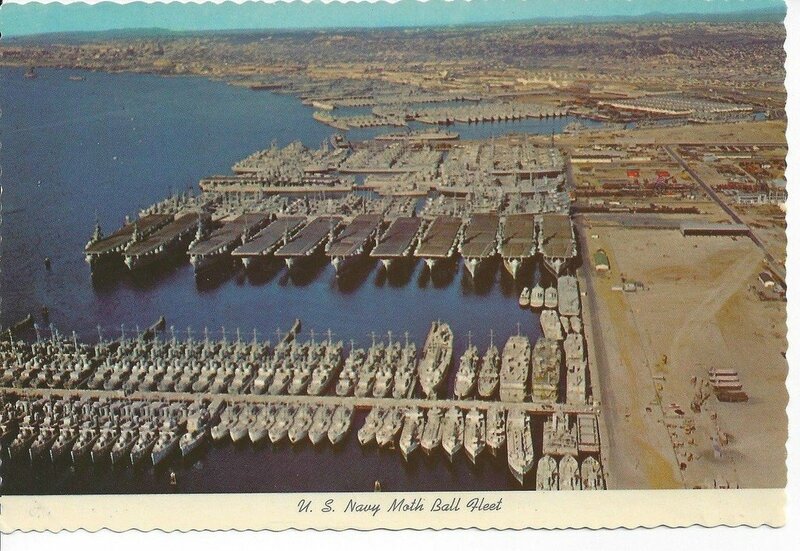 The Navy Mothball Fleet in the 1960s or before at San Diego. When I went to my basic training in San Diego, 1960, I remember that I bought a postcard like this. Those many ships, that was impressive. This image came from this webpage, click here! I’m sure; the mothball Fleet at Subic Bay was not that big, ha, ha! I remember going to the Palau Island in the 1970s and inspect ships, mothballed there. Zc857. 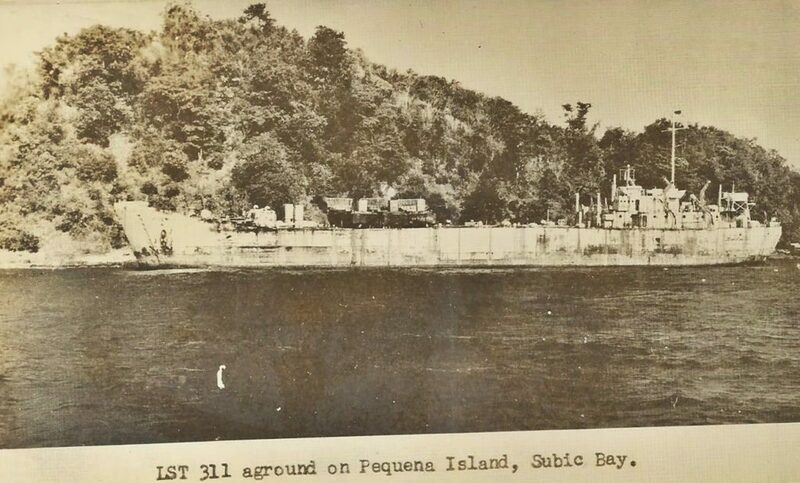 05 1951-06-20 Subic Salvage Survey 04, Pequena Island. 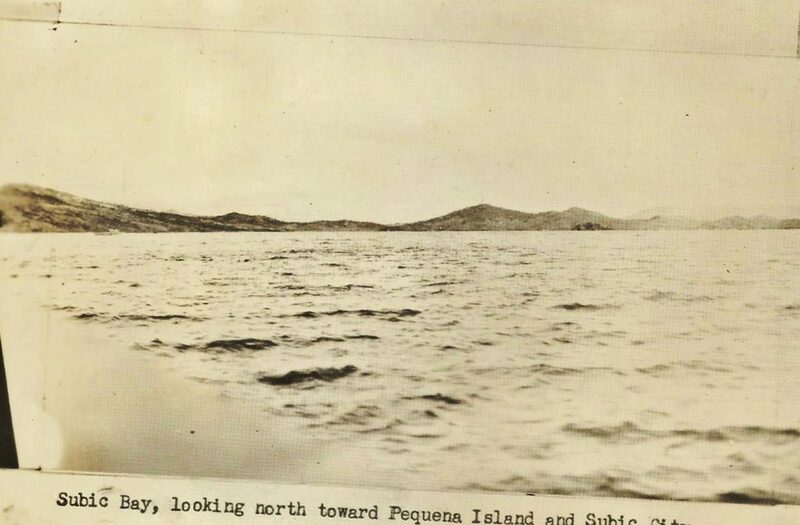 Pequena Island Group. LST-311 aground at the west side of Pequena Island. LST-371 aground at Calapacuan Point, NW of Grande Island. Zc858. 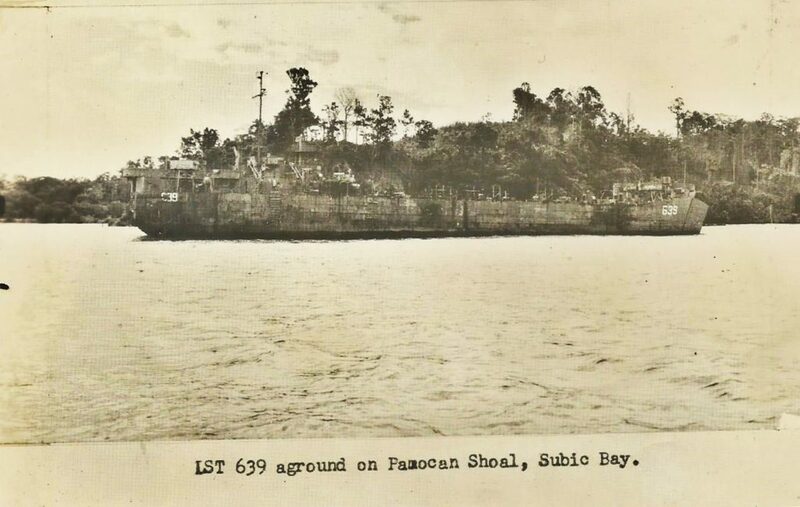 06 1951-06-20 Subic Salvage Survey 05, Cabangan Pt. 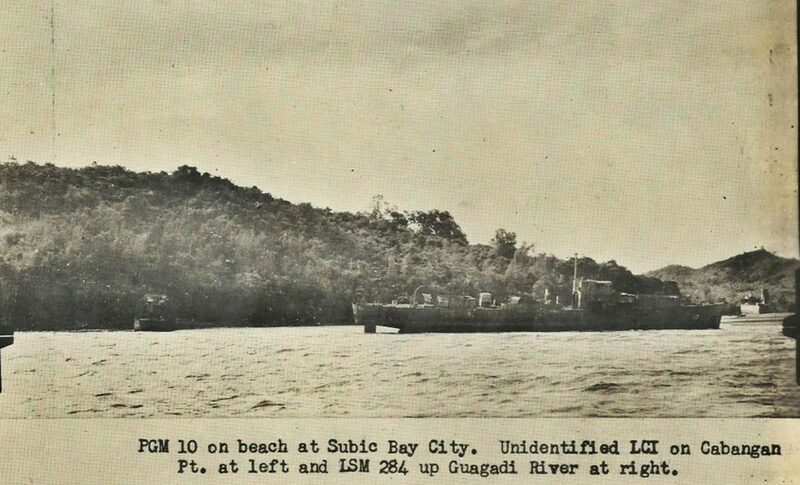 PGM-10 on beach at Subic Town, unidentified LCI, left at Cabangan Point and LSM 284 up Guagadi River at right. Zc859. 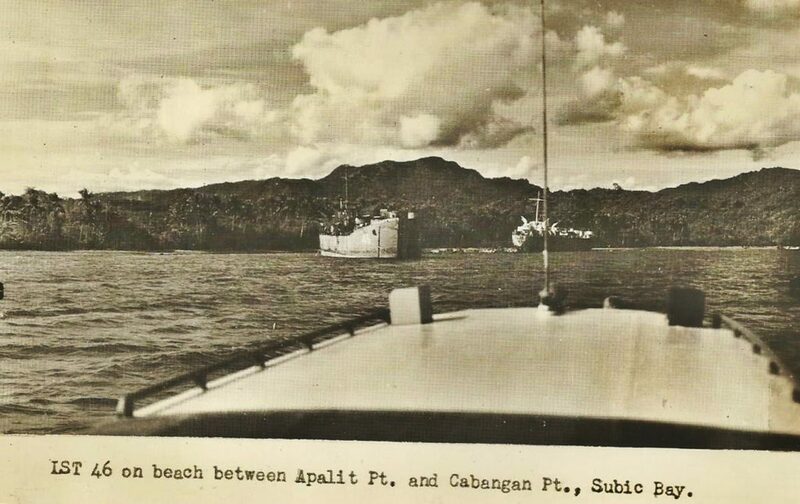 07 1951-06-20 Subic Salvage Survey 06, Guagadi Rv. 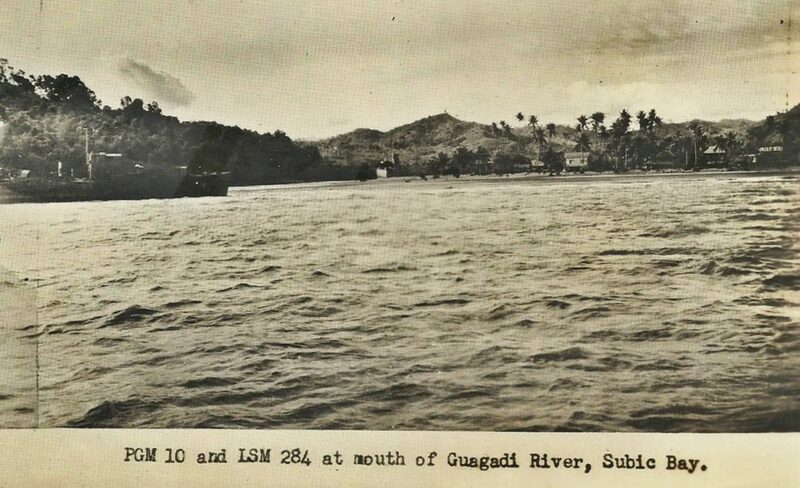 PGM-10 and LSM-284 at mouth of Guagadi River, Subic Town in Subic Bay. Zc860.Port Binanga area. LCI on beach just inside Buing Point. 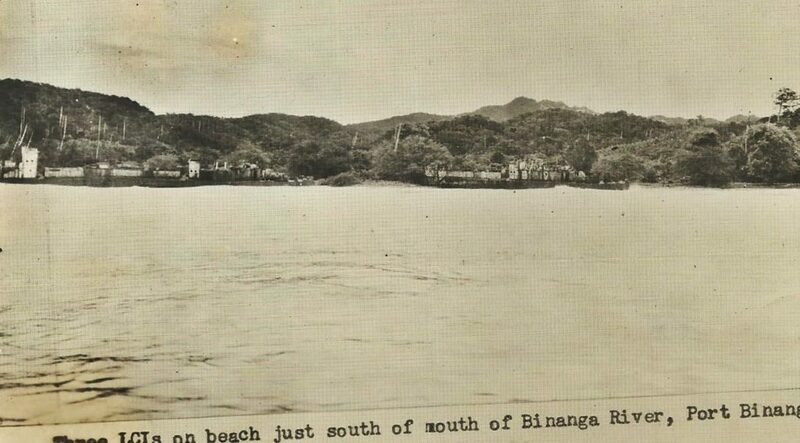 Six LCIs on beach at head of bay, three on either side of mouth of Binanga River in center background. Two mor interesting points about this bay, the Alamo Scouts of General Krueger had an Operating Base and Training Center her in 1945. After the WWII the Navy UDT (Frogmen), later the Navy SEALs did training here out of submarines. Zc861. 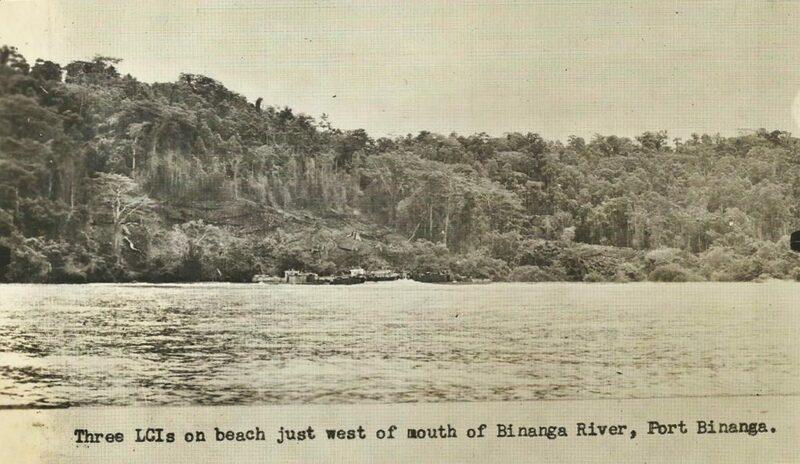 Three LCIs on Beach just west of mouth of Binanga River, Port Binanga. Now you can drive along the head of the bay, along the Bataan West Road. 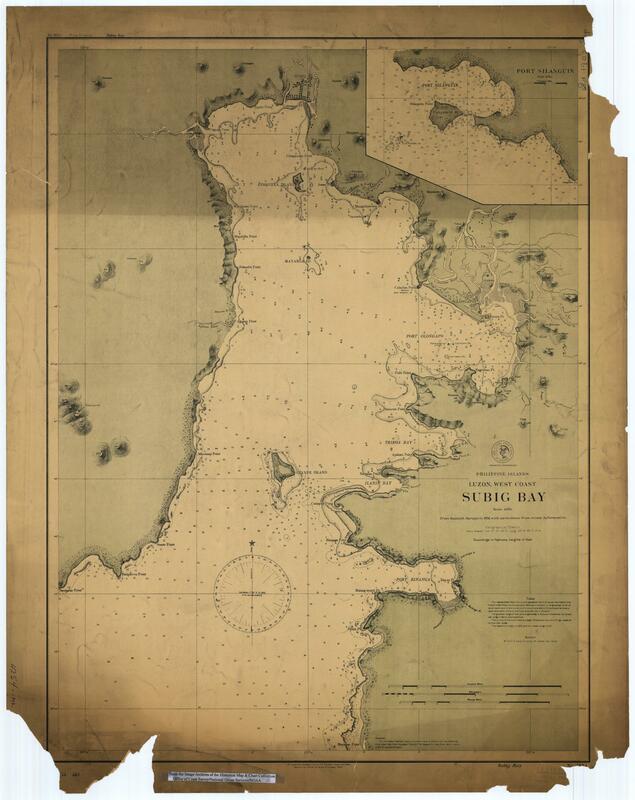 Here is an 1902 USCGS Subic Bay chart. With this URL you can download a high resolution copy, click here! If you are really interested where the landmarks are, you should download this map. On this chart and the previous one you can identify all the landmarks mentioned. This one is the best, I added it. Zc862. 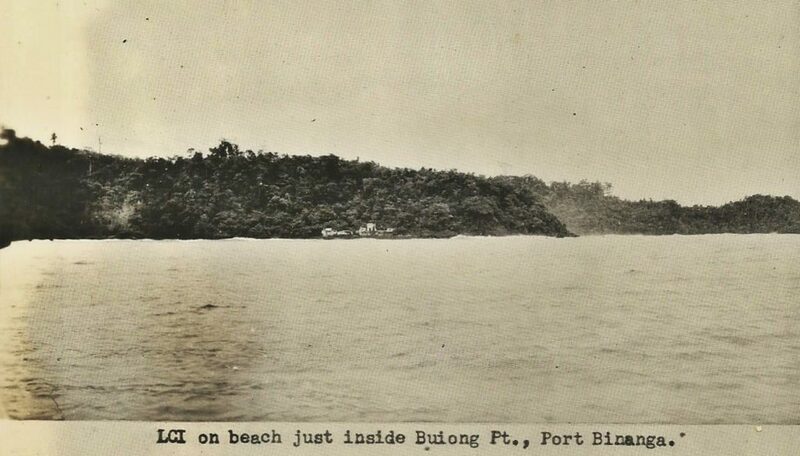 Three LCIs just south of mouth of Binanga River, Port Binanga. Zc863. LCI on beach just inside Buiong Pt.,Port Binanga. Zc864. 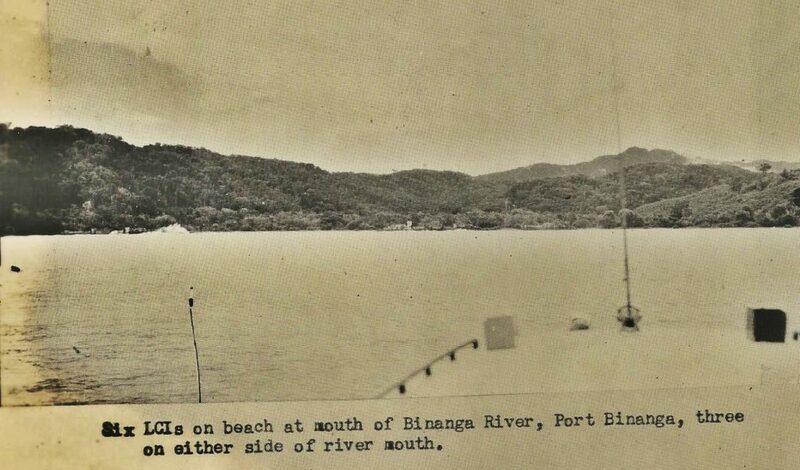 Six LCIs on beach at mouth of Binanga River, Port Binanga, three on either side of the river mouth. Zc865. LST-46 on beach between Apalit Pt. and Cabangan Pt. Subic Bay. Zc866. 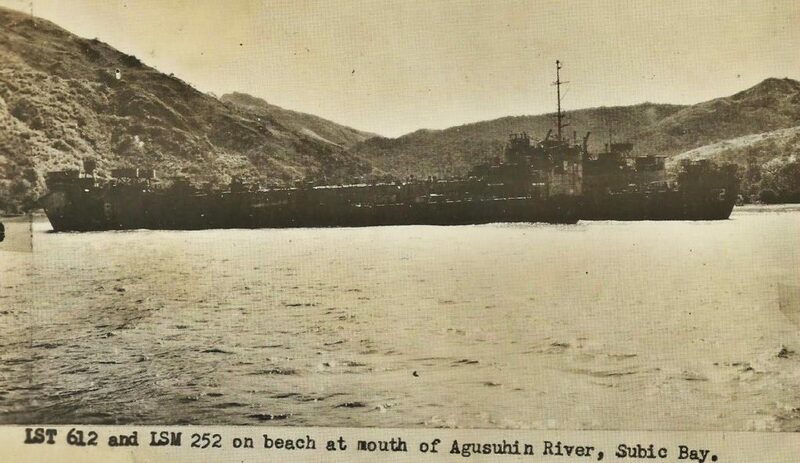 LST 612 and LSM-252 on beach at mouth of Agusuhin River, Subic Bay. This valley used to be Green Beach, training area for the U. S. Marines. Now it is site of the Hanjin Shipyard. I see a pier and perhaps navigation Light, they are gone now! Zc867. 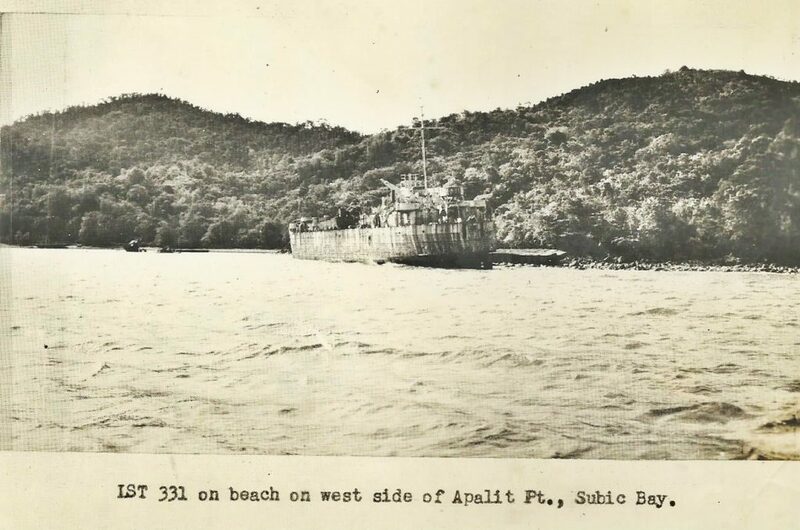 LST 612 and LSM-252 on beach at mouth of Agusuhin River, Subic Bay. This valley used to be Green Beach, training area for the U. S. Marines. Now it is site of the Hanjin Shipyard. Zc868. 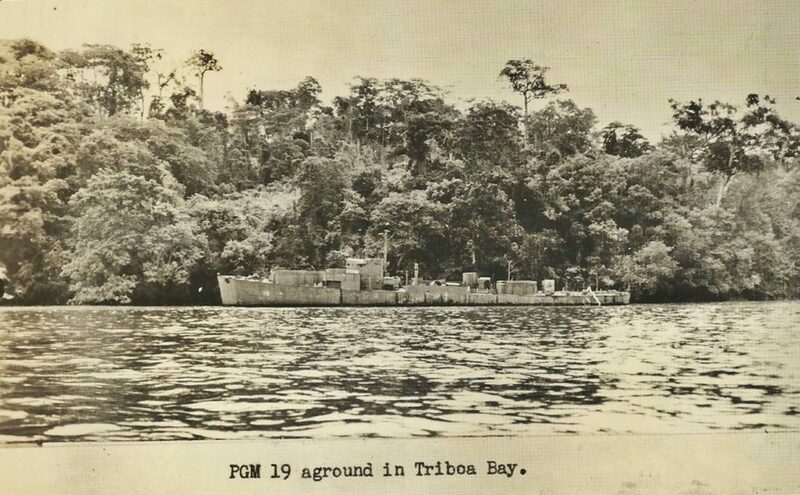 PGM-19 aground in Triboa Bay. Zc869. 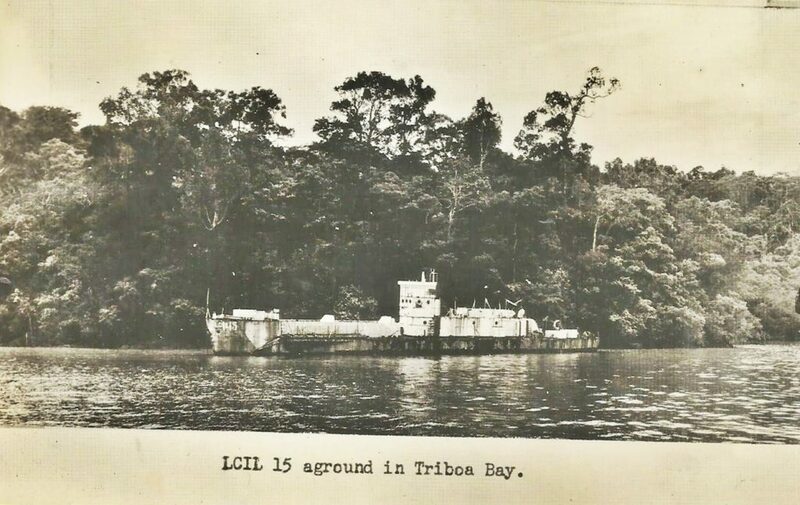 LCIL-15 aground in Triboa Bay. 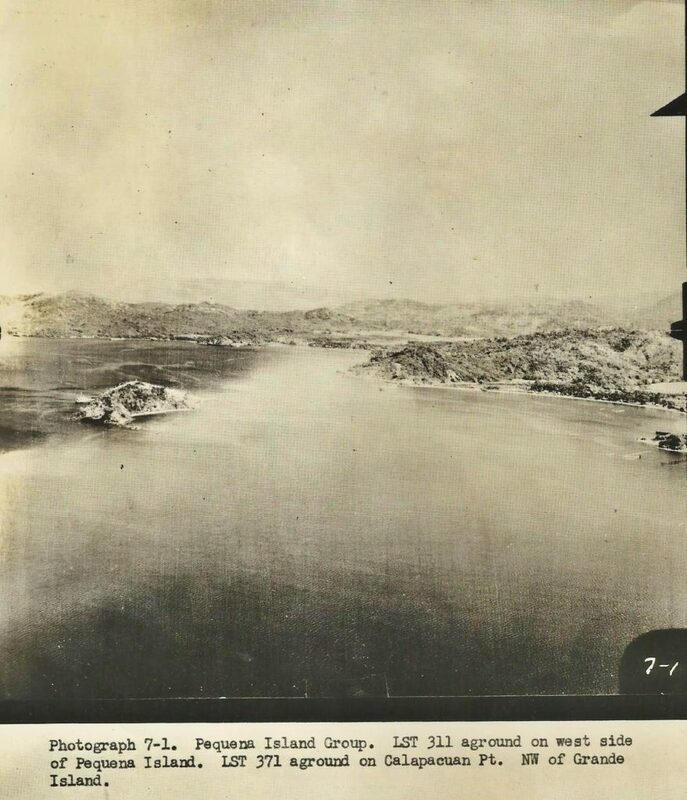 Zc870.Subic Bay views, looking north toward Pequena Island and the Subic Town at right. What we Sailors called Subic City would be a little more right. Zc871. LST-639 aground on Pamocan Shoals. Pamocan Point was about where the west end of the Cubi Point runway is today; the shoals are out a little more west. It is shown on one of the maps. Zc872. 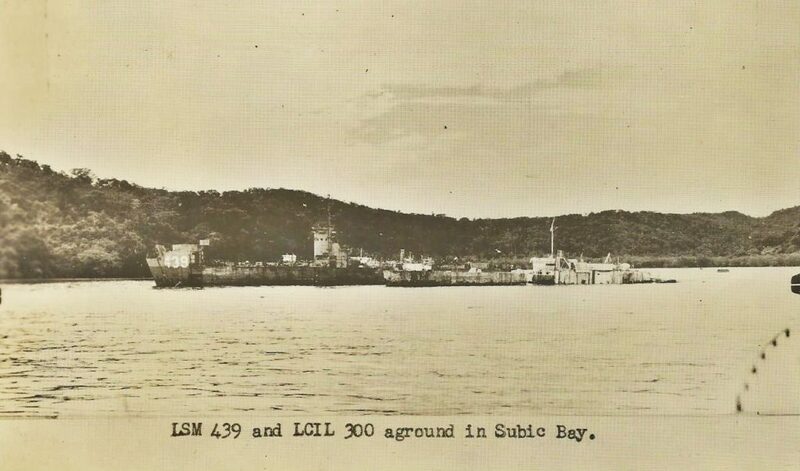 LSM-439 and LCIL-300 aground in Subic Bay; I am unable to pinpoint this location. Zc873. 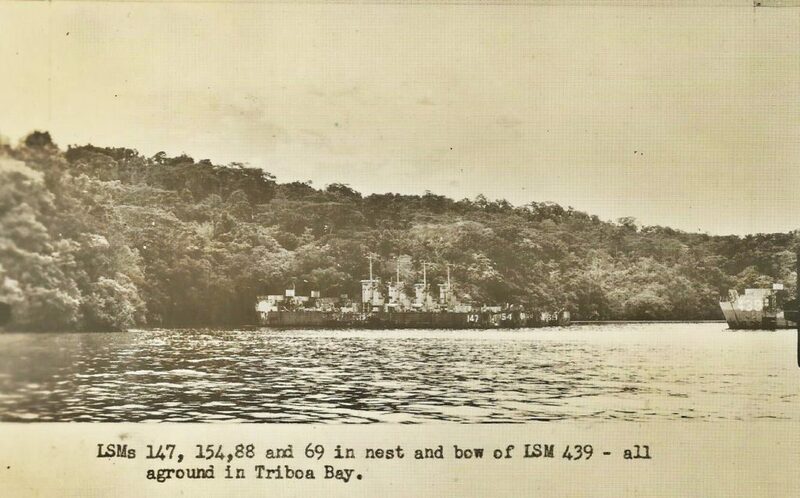 LSMs 147, 154, 88 69 in a nest and bow of LSM 439 – all aground in Triboa Bay. 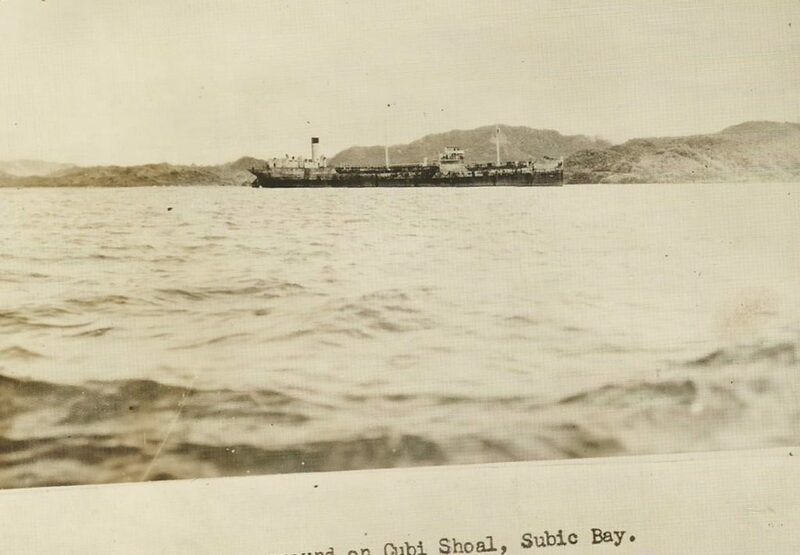 I suspect that the most of the ships of the Mothball Fleet Subic Bay were anchored here, in a nest, in Triboa Bay. Zc874. 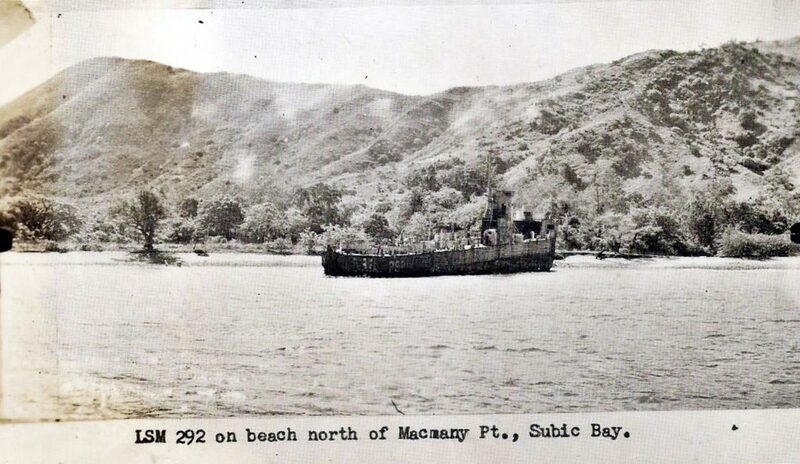 LSM-292 on beach north of Macmany Point, Subic Bay. In this picture we have a clear view of Mt. Cinco Picos.I am sure this is the next valley, south of the Agusuhin Valley, were the USMC Green Beach training area was and where now the Korean Shipyard Hanjin is located. Zc879. LSM-292 on beach north of Macmany Point. That is just south of USMC Green Beach at Agusuhin Point. Zc880. 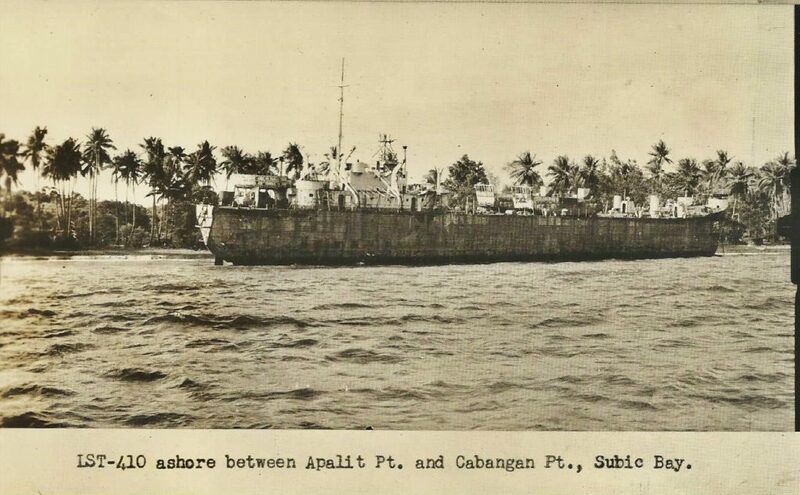 LST-331, LST-46, LST-410 aground in vicinity of Apalit Point, Subic Bay. That is just west of Subic Town. Zc881. 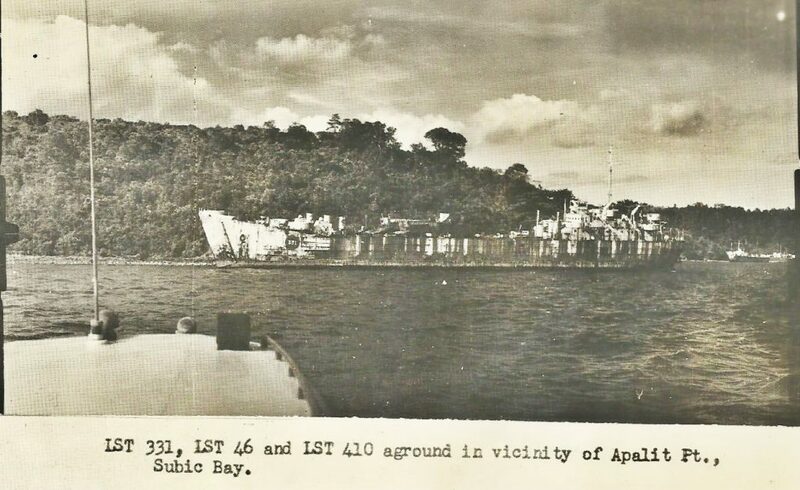 LST-331 on west side of Apalit Point, Subic Bay. That is just west of Subic Town. Zc882. 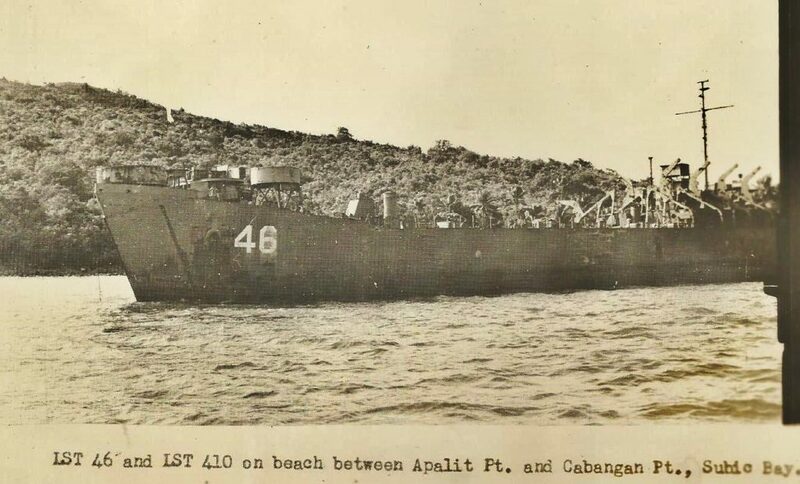 LST-410 ashore between Apalit Point and Cabangan Point, Subic Bay. That is just west of Subic Town. Zc883. 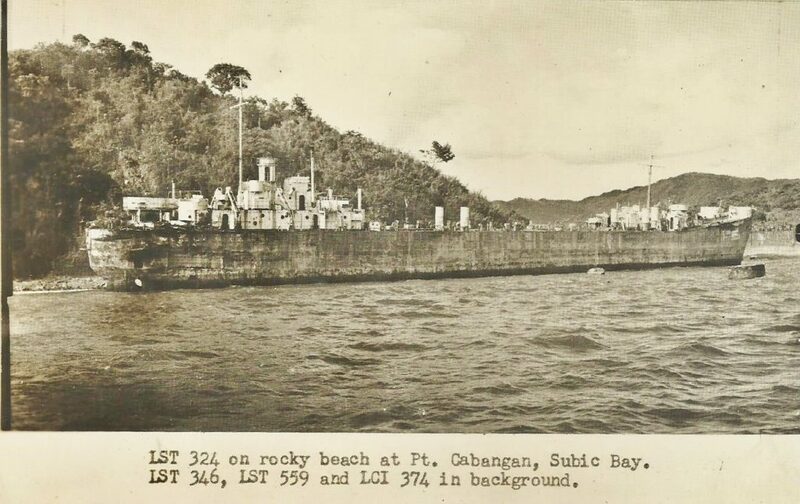 LST-324 on rocky beach at Point Cabangan, Subic Bay. LST-346, LST-559 and LCI-374 in Background. That is just west of Subic Town. Zc884. LST-311 aground on the west side of Pequena Island, some of sailors called it Snake Island. I notice there are still 3 LCM-3 (Mike Boats) on the topside deck. Zc885. 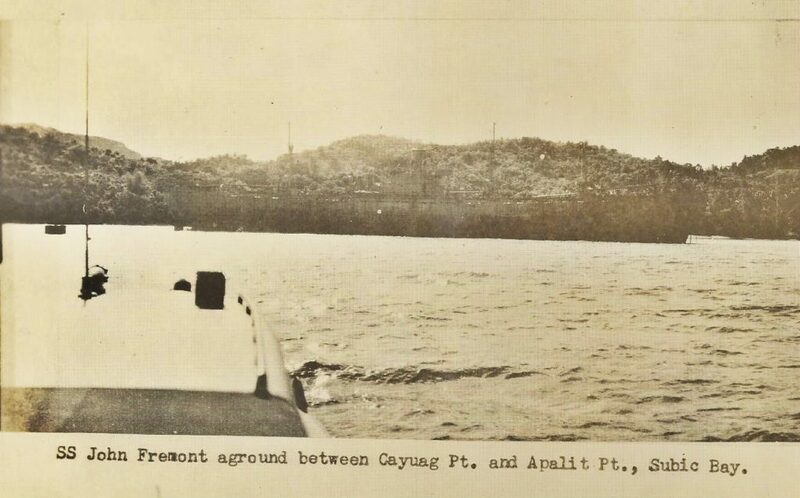 SS Fremont aground between Cayuag Point and Apalit Point, that is in the upper NW corner of the bay. Zc886. 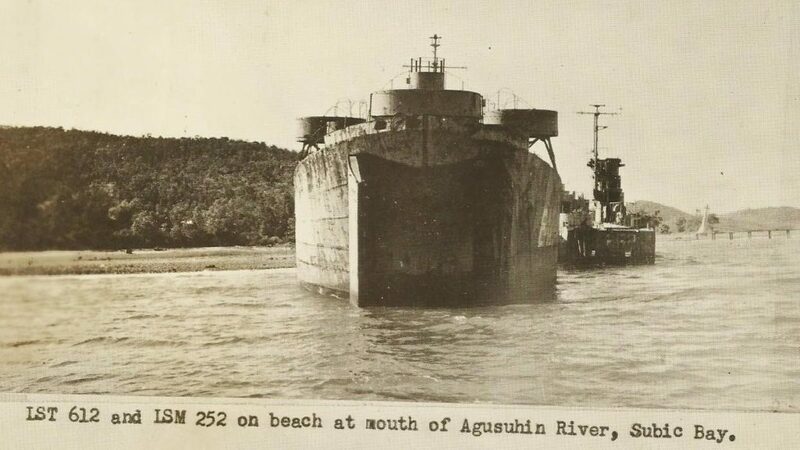 SS Banshee aground on Cubi Shoals, just think, behind it the Navy Seabees flattened those hills, pushed them into the sea to build the long runway for the Cubi Point Naval Air Station. That work started shortly after 1951. Zc887. 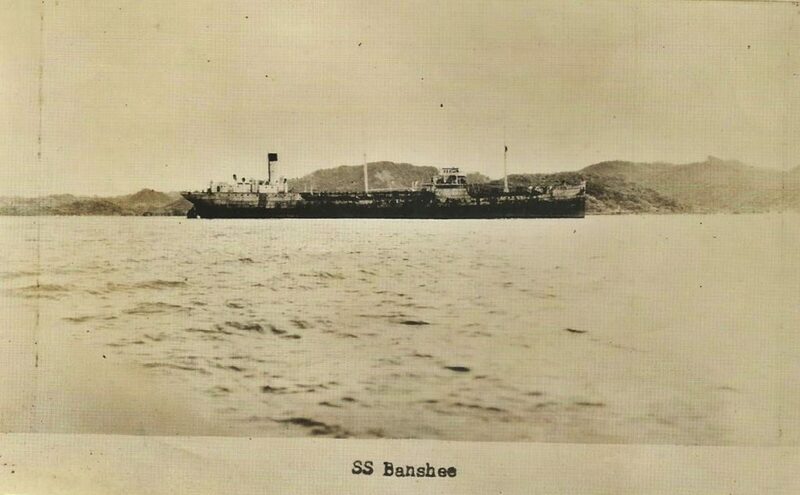 SS Banshee aground on Cubi Shoals, just think, behind it the Navy Seabees flattened those hills, pushed them into the sea to build the long runway for the Cubi Point Naval Air Station. That work started shortly after 1951. Zc888. 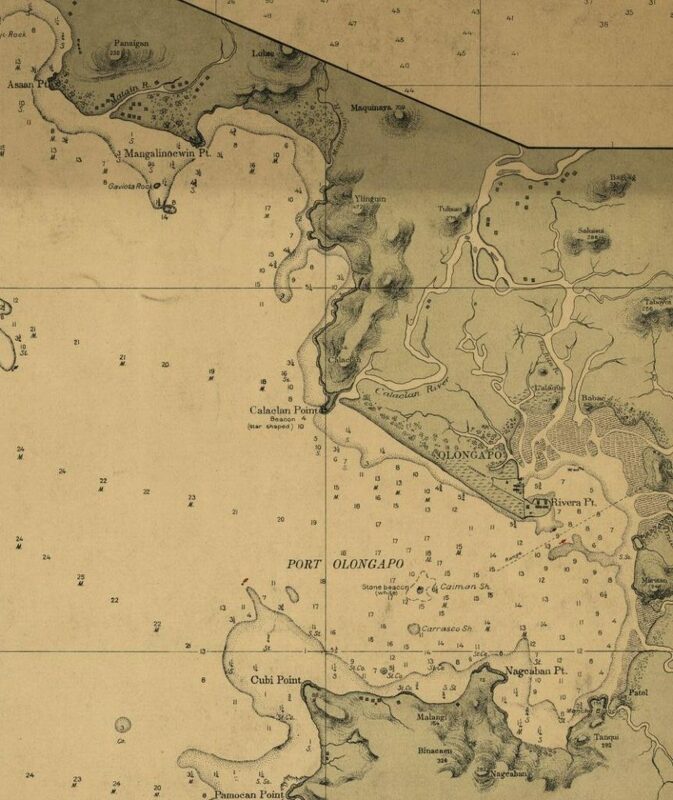 A zoomed-in section of a 1902 USGS map of Subic Bay and shows the Port of Olongapo, the Cubi Shoals, indicated on the other map in this album is just a little west of Cubi Point.